Majestic and sorrowful, melodic and powerful, Sweden’s finest export have been rocking the socks of metalheads for years. Yet for some reason, there’s a large proportion of metalheads for whom the band are a niche concern rather than at the top of playlists. 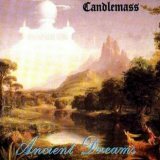 Regular readers will know that this is a fate that befalls many, if not all, doom bands, so since Candlemass are the very essence of doom it’s no surprise that they are in the same boat. In any case, this is a real shame, especially considering what wonderful music is being missed out on. There was a brief period from 1986 to the early nineties when Candlemass could do no wrong, putting out solid gold doom, album after album. Right in the middle of this, in the midst of their career-high, comes an album all too often unfairly ignored, their third full-length and a gem of a record – Ancient Dreams. Being buried between albums as good as Nightfall and Tales Of Creation is a fate that you wouldn’t wish on your worst enemy, but Ancient Dreams especially doesn’t deserve it. Eight songs, eight anthems, eight wonderful expressions of gloom with stunning riffs and vocals from the throat of an angel from heaven, come down to warn us mere mortals of the error of our ways. Never has a singer’s name been so appropriate as Messiah Marcolin’s, here on just his second full-length with the band, but already a vital part of the line-up. He’s one of doom’s greatest voices, the perfect vocal accompaniment to what the genre says with its music, and you’re caught in his vocal grasps with each utterance, unable to tear your attention away. You have to praise the rest of the band too, of course, especially guitarists Lars Johansson and Mats Björkman, whose pounding riffage takes the almost celestial opening to first track Mirror Mirror and gives it a heavy metal drive. The almost stoner stomp of The Bells of Acheron is just as wonderful, complete with tolling bells. As those with past knowledge of Master Edling’s skills will know, however, the songwriting is typically beyond solid here. The slow trudge of A Cry From The Crypt providing a perfect post-Sabbathian pounding with seemingly minutes of lovely soloing. The glorious gloom of Darkness In Paradise, the operatic invocations of Incarnation Of Evil, the chilling misery of Bearer Of Pain... few bands can manage to write such consistently excellent music on adjacent albums, let alone creating such a solid run as Candlemass do here. The re-release comes with a bonus track, a Black Sabbath cover medley. It says a lot that Candlemass’ original songs will gain your attention far more than these classic snippets, the band’s stunning compositions seizing you away again and again. I’ll admit to listening to it each time I play the album, however, caught up in fantasies about someone with Messiah’s round, full-of-life power fronting Sabbath rather than Ozzy’s thin weediness... Yet the ultimate compliment you could give Candlemass, as I’m sure the members themselves would agree, is that they are a worthy successor to Sabbath, taking the legends’ crown and becoming gods of doom in their own right. They’re certainly a band that demand more respect than they receive, and Ancient Dreams is an excellent slice of doom that all gloombahs need to own and love. Not their best, perhaps (the unbelievable Epicus Doomicus Metallicus will forever own my heart) but still classic music from a classic band.